Sometimes the simple things are simply just the best like roasted garlic. I would guess that all you need is about 3 cloves garlic to 1 tablespoon extra–virgin olive oil or grapeseed oil and your oven and you can transform ordinary garlic into a delicate flavor–packed accoutrement that you can add to all different dishes, making them come alive. Simply pre–heat your oven to 325 degrees and peel off the outer layer of the skin on the garlic first. Trying to move as much of it as you can and then it makes it very easy to use the garlic once it is roasted. Drizzle 1 tablespoon good quality extra virgin olive oil or good quality grape seed oil. Both are monounsaturated oils and the extraordinary thing about the grapeseed oil as it has a ton of vitamin E in it which is really good for your heart. They’re both really fantastic for you though. Simply bake for 25 minutes and then use in all kinds of dishes from pasta to casseroles to breads like focaccia, your pasta sauces, calzones, vegetarian dishes, there so many things! You can roast way more than three cloves at a time, you’ll just have to add the extra virgin olive oil to them. Another great thing about roasted garlic is, it’s super easy to peel because you really don‘t peel it completely. You squish it out of the clove! That’s right! The flavor of garlic mellows and adds a nice subtle flavor to your favorite dishes. You simply take the roasted garlic clove and it squishes right out of the outer skin. Some Garlic Lovers like me like to use it as a garlic bread topper. Instead of adding a bunch of butter and other things to your fancy sourdough bread, simply takes them roasted garlic and mix it with a little bit of extra virgin olive oil or butter and it’s amazing flavor. You can have all the paprika to your garlic bread too. 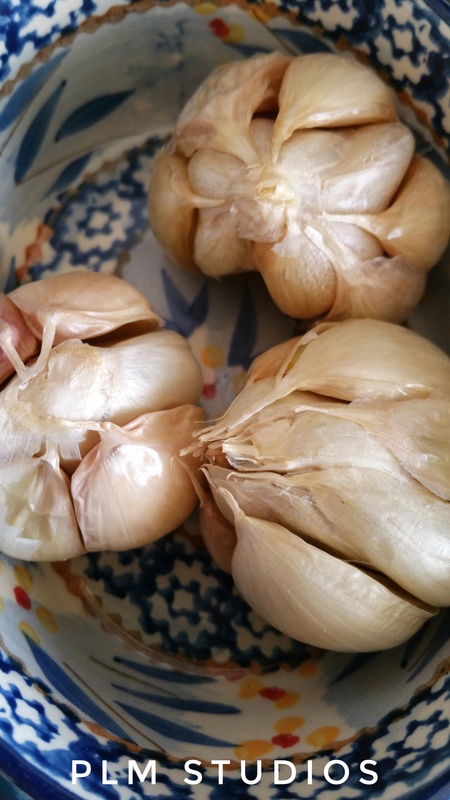 Hope you enjoy this recipe and come up with ideas that you can use roasted garlic into too. Recipe written by Paulette Le Pore Motzko. Photography and Digital Photo Arts by Paulette Motzko. Copyright January 2018. PLM Studios, Las Vegas, Nevada.